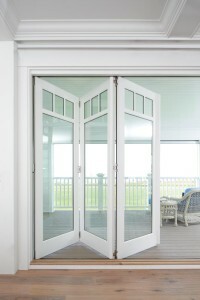 Here are some of the most popular choices for sliding patio doors and folding patio doors. The Marvin Bi-Fold Door is the perfect way to connect the beautiful outdoors with your custom home. This innovative door can have anywhere from two to eight panels that smoothly fold to one side, creating an effortless transition from room to room or room to landscape. The panels are hung from a header and easily slide along an extruded aluminum sill track. Comprehensive weather stripping and low-e glass options create a durable and efficient scenic door system for any climate. One of the most popular features with the Marvin folding patio door is the single hinged outswing door that can be used for everyday convenience when you do not want to open up all of the panels. Marvin "Bi-Fold" Folding Door with a pre-finished factory white paint on the interior. The Multi-Slide Scenic Door is another great option for adding the beauty and grandeur of a panoramic view with the accessibility of your every day slider. This door comes in a variety of custom designs and sizes to guarantee the perfect fit for your home. With design in mind, all panels can either slide one direction or utilize a bi-parting configuration. As an extra option, panels can either stack within the frame, or pocket directly into the wall. 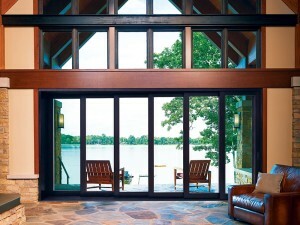 Sizes for the Multi-Slide Scenic Door go up to 50 feet wide and 12 feet high. Lastly, Marvin's Ultimate Lift and Slide Door gives you the freedom to dream a little bigger. This breathtaking design is available in a plethora of sizes (up to 48 ft. wide) and configurations, making sure that you get exactly what you're after. Much like the "Multi-Slide" Sliding Patio Door, the Lift and Slide can accommodate stacked panels or utilize a pocketed configuration, allowing each panel to disappear into the wall. Both, flush and recessed sills guarantee a seamless transition from exterior to interior, helping to make this door an excellent addition to your home.